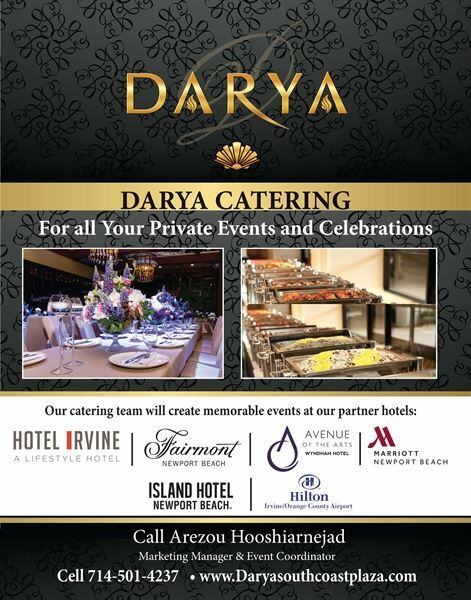 Darya South Coast Plaza has been serving all of Orange County residence and businesses, high end, delicious authentic Persian Cuisine for 30 years. We are now bringing our fantastic food to your wedding, celebrations or business meetings. We can cater from 50 to 600 guests! Our catering team is ready to serve you and in bringing high quality delicious Persian food, along with great experience to you and your guests. We also offer food tastings to our brides and grooms, so we can customize the menu to your taste and budget.